A Pakistan International Airlines passenger plane crashed soon after takeoff on a domestic flight Monday in eastern Pakistan, and all 45 people on board were killed, officials said. The 27-year-old Fokker F-27 twin-engine aircraft slammed into a wheat field on the outskirts of the city of Multan two or three minutes after takeoff for Lahore, spiraling in the air before it hit the ground and burst into flames, witnesses said. "All 41 passengers and four crew members on board the plane have died," said Iftikhar Babar, the district coordination officer for Multan, which lies about 400 miles southwest of the capital, Islamabad. Malik Bashir, PIA's station manager at Multan airport, confirmed there were no survivors. He said the cause of the crash was not yet known, but ruled out the possibility of a terrorist attack on the state's carrier's plane. A female flight attendant who was pulled alive from the plane's wreckage died later at a hospital, airline security official Mohammed Iqbal said. A PIA emergency department official who identified himself with the single name, Bashir, said the dead passengers were 33 men and eight women, all Pakistani. They included two army brigadiers, two judges of the High Court in Lahore and the head of a state-run university in Multan. Two male pilots and two air hostesses also died, he said. President Gen. Pervez Musharraf expressed grief over the crash and ordered an investigation to determine the cause, state-run Pakistan Television reported. Chaudhry Bashir, a PIA spokesman, said the crashed plane was inducted into the airline's fleet in 1979. It had flown 49,100 miles and was due to be grounded on completing 55,900 miles. He said PIA has six other Fokker planes in its fleet — mostly flying less-busy routes to provincial cities — and defended their safety. "No PIA plane can come on the runway before it is fully looked after for maintenance," he said. Bashir said flight PK-688 took off normally on a flight to Lahore, the capital of eastern Punjab province, at around 12:05 p.m.
"Whatever happened to it was after takeoff," he said. 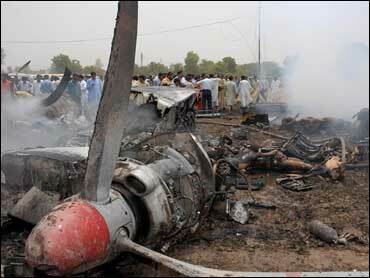 Plane debris, newspapers, cold drink bottles and clothes littered the crash site, about two miles from Multan airport. Emergency workers wore face masks to protect against thick black smoke and the smell of burning oil and flesh. After firefighters doused the fire, rescuers pulled bodies from the smoldering wreckage. The fire left the plane's fuselage a blackened hulk and its seared tail lay on its side. Bodies were taken to the morgue at state-run Nishtar Hospital in Multan, where about 500 relatives, women weeping and beating their chests in grief, gathered to claim the remains of loved ones for burial. At least five bodies have been claimed by relatives but many were burned beyond recognition, said Dr. Gul Nawaz. Relatives were trying to identify the corpses from clothing and other belongings. Mohammed Nadeem, a jeweler who lives near the crash site, said the plane was rotating sideways in the air before it hit the ground and went up in flames. "There was a huge explosion after the plane hit the ground," he said. Another witness, Arshad Gujjar, 35, who had been cutting a tree in a nearby orchard, said the plane had come down "abruptly" and hit the ground with a huge thud. It caught fire and caused a fire at a nearby power line, he said. At least eight fire trucks helped put out the blazing wreckage as police and army troops ordered hundreds of onlookers to keep back. The crash could put PIA's safety record under close scrutiny. The airline has reported a number of emergency landings in recent years and in December 2004, several passengers on a domestic flight were injured when one of its jets suddenly dipped, fearing a midair collision with another plane. In August 1989, another PIA Fokker, with 54 people onboard, went down in Pakistan's Himalayan north on a domestic flight. The plane's wreckage was never found. In September 1992, a PIA Airbus A300 crashed into a mountain in Nepal, killing all 167 people on board. Investigators found the plane was flying 1,500 feet lower than it reported as it approached Katmandu airport. In February 2003, a Fokker F-27 of the Pakistan Air Force crashed in mountains near the northwestern city of Kohat, killing 17 senior officials including the then-air force chief Mushaf Ali Mir.